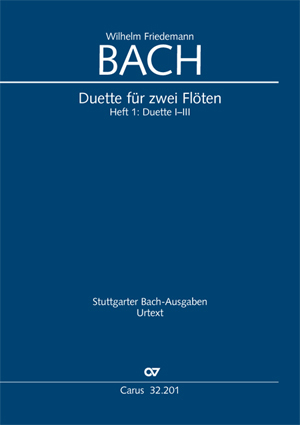 The six flute duets were obviously conceived as a self-contained set of works and are published in two volumes. 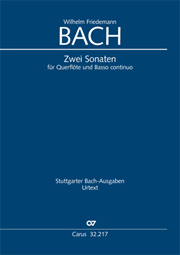 The six works reveal W. F. Bach's supreme mastery of contrapuntal writing. 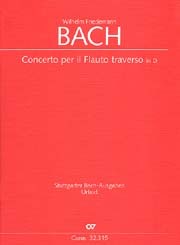 The uncompromising professional standards are documented in the harmonic and polyphonic audacity of the pieces, just as they are in the technical difficulties that Bach demands of performers. Almost no other composer since J. S. Bach has developed the art of two-part writing, with such a high degree of harmonic agility, melodic flow and formal elegance, to the level that Wilhelm Friedemann Bach achieved in these six compositions which, in a certain sense, represent a summation of his life's work. Die sechs Flötenduette von Wilhelm Friedemann Bach gehören zu dem schönsten, was im Spätbarock [...] für Traversflöte geschrieben wurde. Ces six sonates sont les duos les plus expressifs, les plus ambitieux et les mieux écrits pour la flûtes de cette époques.